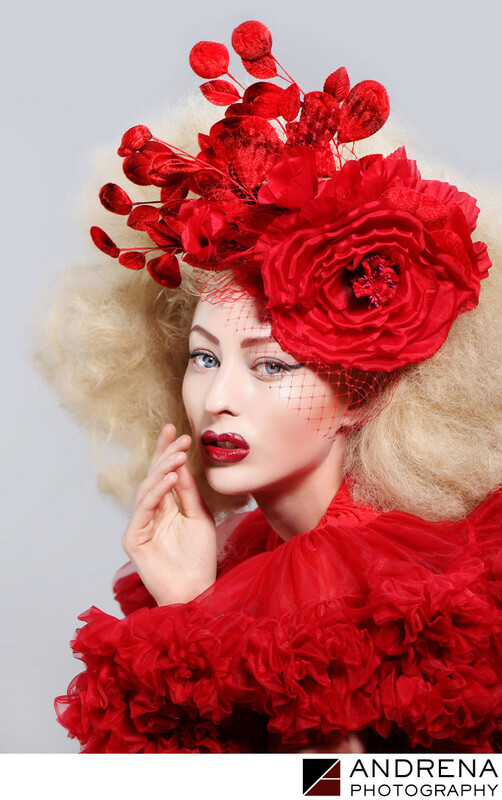 Beauty photography focuses on faces, makeup, accessories and style. Images are generally very tightly cropped to show off a model's facial features and makeup, as well as hair style, jewelry and headpieces or hats. As a beauty photographer in Los Angeles, I've had the great fortune to work with some truly stunning models, and to show off the intricate work of many talented makeup artists and hair stylists. For this image of model Laura New Myers, I set up three V-flats and three strobes. I positioned one white v-flat behind her, and two v-flats to the side. I then positioned a white reflector at elbow-height, which helped to fill in shadows. The image was lit with two strip boxes and one beauty dish. This lovely cocktail hat was created by couture headpiece artist Arturo Rios. Laura handled her own makeup, which was perfect in its simplicity. A model's ability to communicate with her eyes and hands always helps a photographer create a more stunning image, as was the case here. Photographed at my studio in Los Angeles, California.